This Prelude is extremely directional, the expected tonic A chord arriving only in the very last bar, and the first proper dominant right before it. There is not a single G sharp, leading-tone of the main key, that appears as a harmonic tone anywhere in the piece before the next-to-last bar. The piece does open on a V chord, but is a minor one, not major, tricking us into thinking E minor is the home key, before quickly drifting towards other tonal regions. My personal guess is that the composer started writing this Prelude with this idea of outlining a global Vm – I movement. However, within the common tonal practice, minor Vs cannot appear at the beginning of structural harmonic units – they adopt a passing role between two “normal” functions of the key, such as I and VI, or appear in the middle of harmonic sequences. The only possible way to have a piece start with a Vm chord is then to justify the chord as a borrowing from a neighbor key. Looking at the possibilities, the Em chord could be II in D major, III in C major, IV in B minor, or VI in G major. Chopin chose this last option for the first harmonic phrase of the piece, a VI – V – I movement in G, or, if we adopt a non-modulating perspective, of VII. Should the analysis be modulating or not? A good question, on which opinions will differ, but one which is ultimately rhetorical, deciding between a weak neighbor key or a strong tonicization. Certain elements, such as the presence of a cadential 6/4 chord, typically point to a new key establishment. But this Prelude is not typical, and for me the outlining V – I background idea roots the whole piece in A minor. The V/V turns into a German augmented 6th version, and then, bam, a stroke of genius as Chopin makes the following chord play the role of V and I at the same time. Relative to the V/V in the preceding bar, this second inversion A minor chord is a cadential 6/4 playing the role of V. But as a dominant pedal starts there, the chord is retroactively perceived as a I over a V pedal, starting a I – VI – IV – II – V progression. Effectively, two harmonic events happen in parallel here: on one layer, the I 6/4 resolves through the pedal to the V in bar 21; on the other, the chord progression takes place, eventually leading to the same V. Part of what makes this dual reading possible is the contradictory placement of the VGer/V – I 6/4 progression, extremely cadential, at the beginning of what is formally the continuation phrase: the chord acquires thus this ability to function both as an arrival point and a beginning. This is an example of what Jonathan D. Kramer calls multiple time, created by the conflict between the gestural time of this cadential gesture and the linearity of its form. The 1+2+2 pattern is retrograded and compressed to create acceleration towards the cadence, introducing 1.5 bars-long chords which create metric dissonance, building on the process started by the shifted accompaniment pattern appearing across bars 18-19.
the E and Eb alternating neighbors of D in bars 6-7 sound suspiciously like E and D#, a tonic/leading-tone oscillation. 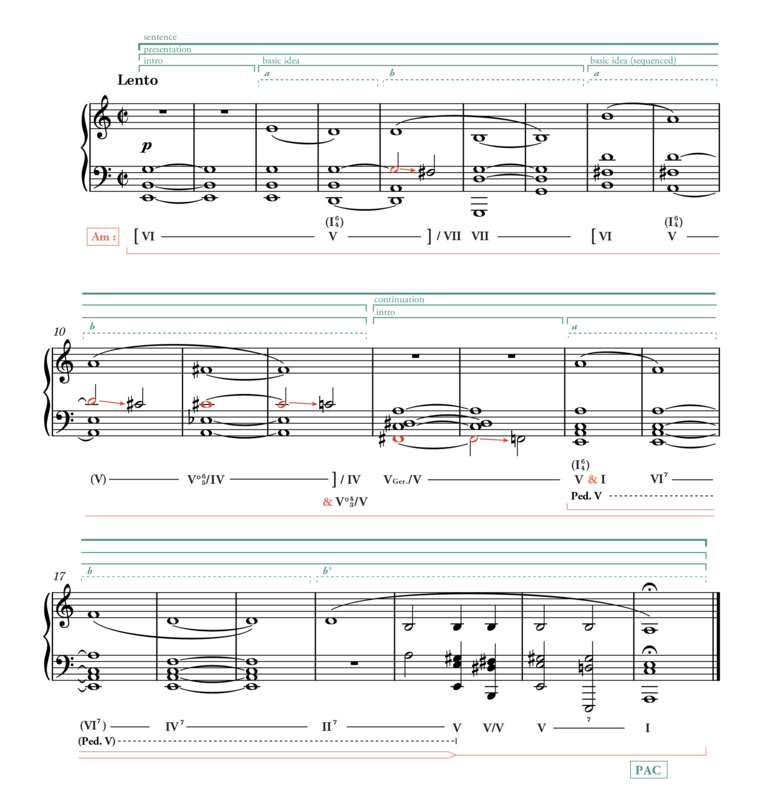 The surface chromaticism disappears in the continuation part, leaving space for the pedal and the 7th chords – a good lesson in complexity control. The a motive starting point is delayed or anticipated when it is repeated, further contributing to the formal fluidity. There! Quite unusual, this one was exciting to dive into – we will get back to something more normal next with number 3. Thoughts, comments? Have a go at it below!